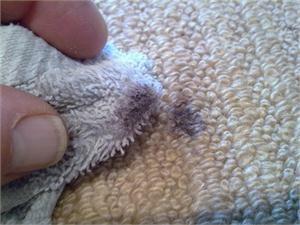 "I am sometimes asked what products we use and how the cleaning process actually works. I am really enthusiastic about the services we provide and I admit get carried away with the explaining the process, when you enjoy what you do you can not help but talk about it. I thought I would highlight a few products and the equipment we use." "The processes and chemicals/solutions explained are for interest only and not an indication or suggestion that readers should use these methods or chemicals and solutions. Always observe safety precautions and follow the manufactures instructions fully." It has been a while since i've updated this page, time to put that right. We use a a couple of shampoos for various tasks. What are the benefits? Professional shampoos have a blend of various solutions but the three most important benefits are encapsulation, foaming and use as a carrier. The encapsulation is a simple process. As the shampoo dries it encapsulates soiling making extraction with an ordinary vacuum simple once dry. Foaming. When using shampoo it's important to just apply the foam. We use a special foaming sprayer but it's just as easy to mix to manufactures instructions then whip the foam in a bucket and scoop the foam from the top with a sponge and clean your item. Carrier. The most interesting in my view. The shampoo can be used as an agent to carry other specific solutions to achieve a specific result. We use shampoos when spot treating, carpet cleaning and more specifically upholstery cleaning where there are risks of damage using the normal hot water extraction method. One of the most versatile chemicals in our kit and when it's properties and how flexible it is in use are understood it is an indispensable problem solver. 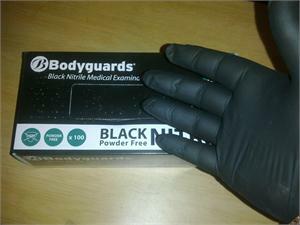 As you can see the Nitrile Glove Pic (1) are a lightweight general purpose glove and provided I use the correct size they behave like a second skin, resisting water and chemical use when mixing and generally as we work. Far more durable than they appear they cost under £5.00 per box and we purchase them here from Brosch Direct. Great for painting, working on the car and many other general tasks. 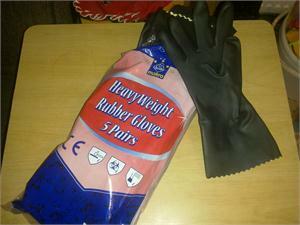 Our Heavy Weight Gloves Pic (2) we use for more difficult tasks. When using descalers for toilet cleaning, cleaning bathrooms where more protection is required or heavy duty degreasing. Very durable and will resist most things thrown at them and they tend to wear out before they split or tear. Most DIY stores will supply these at around £1.50 per pair but we purchase them from the Norwich Makro store, but you will need to own or run a business for access. Whatever type of glove you choose it is always better to use them than risk harming you hands, always follow manufacturers instruction when it comes to health and safety. I have recently been asked to quote and clean some quite large areas, hotel restaurants, nursing homes etc. In the normal way we use an electronic measuring device but with very long corridors and large open plan areas we found one of these. Excelent value, the handle extends out and when i'm done it all folds into a carry bag that slips on the shoulder. Really lightweight and very easy to use. Recommended. 2) The rinse stage. The easier way is to apply the cleaning solution the professional way by sprayer as we do, allow 10 minutes for the solution to work and brush the pile. Then most importantly rinse once dry 3 times with plain water or water with a dash of white vinegar. Thorough rinsing will stop resoling. We use professional rinses specific for particular soiling and specific fibres. This all sounds quite complicated and by the time the hire machine is collected and returned detergent paid for and the day has been lost as you struggle to clean why not relax with a hot beverage (I like coffee) and let me do all the hard work with one of the most powerful extraction machines built and designed in the UK. Sadly there are some so called professional carpet cleaners that do not understand this simple principle so Call me Simon on 01263 833424 or 07876497897 or contact us here today. I thought i'd start with probably the cheapest Item I use on every job and it's the simple cloth. Various sorts. The first and probably the most familiar is the simple cotton cloth or terry towel. I use these in general for spot and stain cleaning, I favour face cloths or 'flannels'. I buy them locally from Roys of North Walsham and they are branded 100% cotton, some prefer the larger size about the same as terry towel nappies but I find them to big to be convenient. The great thing is you can roast these in the washing machine to get them really clean, they are really absorbent and will tolerate some serious abuse. These can also be used for all your general cleaning tasks and make fantastic dish cloths as opposed to the thin Jeye type cloths. One of my favourite cloths is Microfibre. You can buy cheaper versions from various outlets but my preferred supplier is Paragon. More absorbent than cotton I use these in various situations. Post carpet cleaning. Buffing a stair case following cleaning will not only dress the pile but will also remove excess moisture. I also use them for wiping door bars, skirtings etc. Pre and post upholstery cleaning. Some fabrics will simply not tolerate aggressive agitation so gently massaging pre clean solutions with microfibre assists in cleaning. 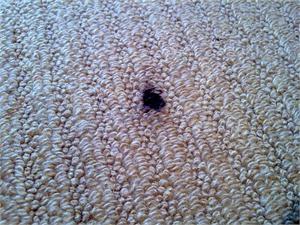 After rinsing a post towel will remove excess moisture and finish the pile. A local caravan and camping site Manor Farm use Arena Cleaning Services to service the shower blocks and this is where the microfibre scores over every other cloth we have used. A quick spray over sinks, toilets etc and by folding the cloth into four all areas can be wiped clean using the various sides as you go. I find a quick once over with a clean dry microfibre cloth brings a really nice shine, fantastic on mirrors, tile and glass, Microfibre is easily rinsed and wrung out and they really can hold an amazing amount of water. I also find I use much less cleaning solution. Each cloth can be washed according to the manufacturer 300 times but trust me they will last longer than that. Get a pack I highly recommend them. Check back next time for some more behind the sofa.